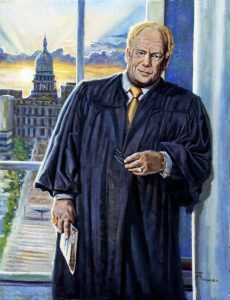 Excited to present this #oilportrait to Justice and Ms Alton Davis for the #MichiganSupremeCourt. The official presentation of the #portrait before the full court will be sometime next year, TBA. I wanted to capture some of the brilliance of the man using a more intense color palette than usual. The capital dome glows in the background, a beautiful view from the Supreme Court building across the Rotunda.